Google Tag manager has become a revolutionary tool for digital marketers and site owners. Giving us a code-free solution to create, update and maintain marketing tech and tracking on websites has made our lives a whole lot easier, and personally, I can't see myself running a site without it. 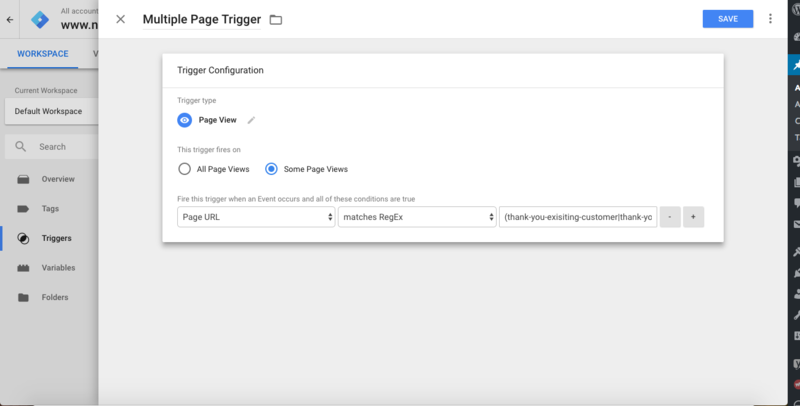 Google Tag manager has a range of built-in features for you to take advantage of but every so often you might want to do something out of the ordinary which the usual template doesn't cater for. One question I get pretty often is how to fire your tags to some specific pages without creating multiple triggers. Since I've been getting this question a lot and thought it best to put together an easy to use tag manager tutorial. It all depends on you and how your site is set up. Let's say for argument's sake you have multiple thank you pages. One for existing customers and one for new customers. When a user completes the purchase process, they are sent to the URL applicable to them. Now let's say you want to track both pages as a single conversion group for your marketing tags, you can do so via this method. 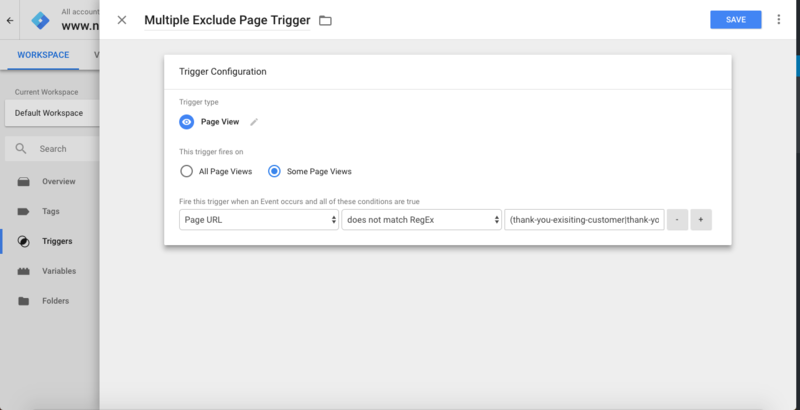 Select trigger fires on "Some page views"
Under the condition select "matches RegEX"
Under the final condition, field adds the end of the URL you would like to match in brackets and separate them with a pipe. Now that you have the trigger available simply apply the trigger rule you want to the specific tags, and you're done. Under the condition select "does not match RegEX"
Under the final condition, field add the end of the URL you would like to match in brackets and separate them with a pipe. I've found this little trick pretty useful when creating tags, especially for conversion tracking tags like your Facebook Event Pixel, Twitter Conversion Pixel, Adwords Conversion tag or Floodlight sales tags. Depending on how your site is set up this trick gives you more control over your tracking and can help you produce more accurate data for 3rd party tools to use when analysing your site visitors user behaviour.